Of the groups clamouring for sovereignty, the campaigns of Independent People of Biafra (IPOB) and the Movement for the Actualisation of the Sovereign State of Biafra (MASSOB) are the most pronounced. They have even had the cause to clash with security agents. 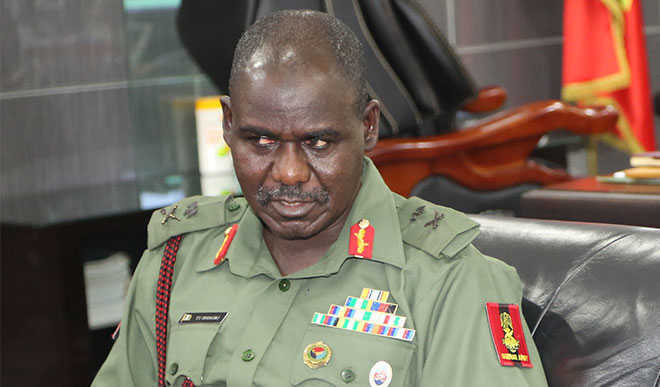 Speaking in Abuja after receiving an award conferred on him by a coalition of over 80 civil society organisations (CSOs), Buratai said the army would not condone any act that could lead to the disintegration of the country. He also promised that insurgency would soon be a thing of the past. “Those individuals and groups that are bent on destablising our country I think they have to wait till may be the next three or four millennium for them to do that. That is, may be the next generation of officers and men will allow them at all,” he said. “Having been given the millennium hero award, I want to call on all the agitators for separation and other acts of destabilisation, they better forget it, not in this era, not in this millennium. “I want to say that we would continue to do our best to maintain security atmosphere that is needed as provided for in the constitution of the federal republic of Nigeria. We have been tasked to defend our country. When I read from Fulani illiterates like the chief of army staff, Tukur Buratai, and other northerners who want to keep Nigeria as a united country by force, it drives me nut. How can these murderous illiterates want Biafrans to remain Nigerians – in a country where we are being marginalized, oppressed and massacred all the time? What type of nonsense talk is this? How can our elders and politicians read this stupid talk and continue to tolerate and swallow these arrogance, intimidation and impunity by northerners. I believe in peaceful process but I have often said that peaceful process will not work in Nigeria. We are dealing with barbaric and murderous Fulani. Biafrans must rethink now -- unless we want to continue to live as slaves in Islamic Nigeria. Tufiakwa and God forbid! His primitivity statement shows the level of his illiteracy &animalistic. Is only a fulani man mayopian will make such a laughable &mundane statement in the world of 21st century. Tukur Buratai's remarks should make every Biafrans to be more determined to achieve the Biafra freedom. Biafrans who are still asleep should wake up from their slumber and join the struggle and send a strong signal message to this Hausa-Fulani man. Just imagine Turkur Buratai opening that dirty rotten Hausa-Fulani mouth of his to spill out nonsense to please Britain his evil puppet master and partner in crime along side of the Yoruba. Turkur Buratai should start to get it into his done=for Hausa-Fulani head that The British experimented expired Nigeria is glancing at it's burial site. Biafa is Freedom all the way!!! I can sense another person taking a permanent bed space in London. Not in his lifetime can mean tomorrow afterall he's not the owner of his life. So I don't see any reason to be angry with this post. I have worst things to channel my anger than to a man who like the little Nwanze decided to challenge his Chi to a wrestling match. Hshshahaha, very correct my brother. Its just an empty threat of a dying man.Nonetheless we Biafrans should be more determined and proactive. It is this man's choice to make. He can either choose that Biafra be achieved in his life time or not. Now, since he has chosen that it wont be in his life time, it means he has chosen to die before the time - very, much sooner than his possible stay on earth. Didn't Buhari say the same thing? Now where is Buhari? Has he not strayed away like a chicken that left home in the morning and failed to come to roost. They say he has appeared to his disciples who were discussing along the road to Emaus and also at some other time in Kano whilst they were enchanting and defining in the name of prayers; saying "Peace be with you'. We shall see the day that he will come back "like a thief in the night". His foolish Hausa-Fulani blokes are still waiting for that day. But it will never come. This man called Burauba has, by this saying, chosen to make his death quicker, because he must surely leave very soon so that God's will will be done. When a tenant insists that the Landlord would not do what he intends to do with his house, has he not chosen to get a quit notice and to vacate the house? Behold, the Lord who is the place from where all the heavens and earth germinated, the time from when all time began, and that brings forth time has, by this his saying, and my declaration, given this man a quit notice from the earth and from among the living right at this moment, amen. If any man doubts this, watch out for this man's life by this time according to the time of life. You will look around and he will be blown away like the smoke that the wind drives away. But then, on the 15th of the 5th month of the movement of Luna this year, this man shall see the pronouncement that will tell him that this is God working and his end is very near. Always know that a shouter will always go by shouting. This illiterate soon live no more, as he said that it is not in his life time that we will achieve biafra. His days are numbered. As you said it with your mouth so shall it be unto you Barutai, let the dead bury the dead, Nigeria army go and bury your dead general buratai. What do you expect to hear from the Chief of Staff of Animal Kingdom? When Buhari said instead of him to allow Biafra to come it's better he go an drawn in the Atlantic, he never know his 10day leave will turn to on month and now "leave of no return ". Time will prove Brutai right because Biafra is scheduled to come soon.